Rotary Youth Exchange provides students between the ages of 16 and 18 the opportunity of a lifetime! It’s a chance to spend 11 months in another country learning the language and culture. Each year, local boys and girls apply through their local Rotary Club and District 7820. Students generally apply in May through September to go on exchange the next year. Outbound students and their parents are guided through months of orientation and information about the country of their exchange year. Outbound students typically stay with two or three Rotary-approved families and receive a monthly stipend for incidental expenses. Rotary Youth Exchange outbound students need to be students who are eager for the chance to try new things and meet new people. You will learn about other cultures, about other people and about yourself. Contact a Rotary Club today for more information. 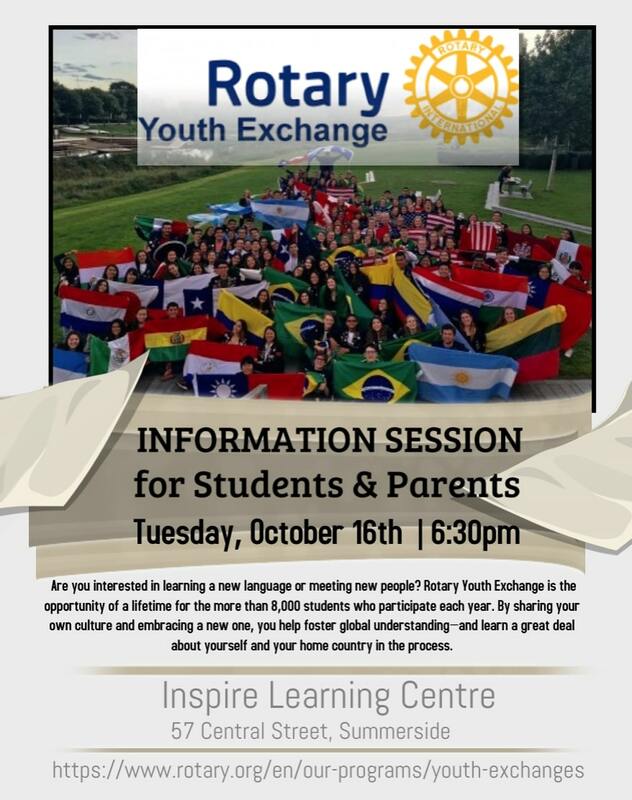 For more information contact Angie Arsenault, Youth Exchange Officer with the Summerside Rotary Club or go to www.rotary.org for complete information on participating countries and other information.